Sometimes it's easy to understand how legends of hauntings get started. 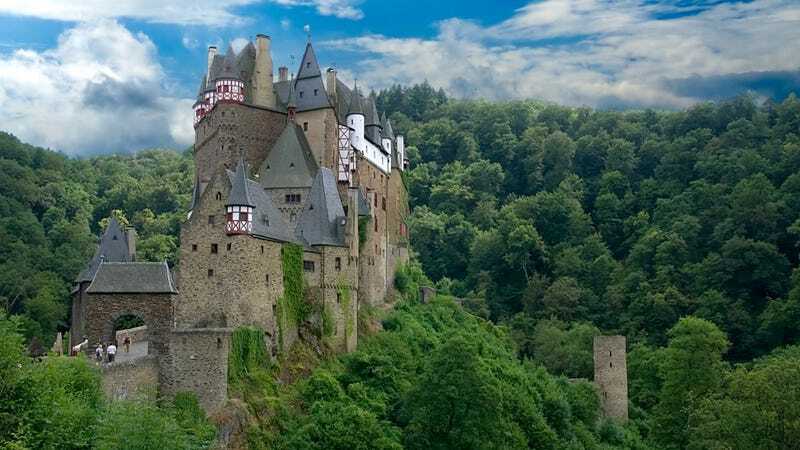 These towering, incredible castles and mansions look like they should contain spirits — and each one has a fantastic ghost story to go along with it. Maybe it's the only castle that is still owned by the same family that lived here 33 generations ago in the mid-12th century. "There is a breastplate and battleaxe in the Countesses’s bedroom. This belongs to the castle’s resident ghost, Agnes, who, as the story goes, died defending the castle and her honor from an undesirable suitor." – according to Lacey Falcone. The sister of Robert Walpole, the first Prime Minister of Great Britain was the second wife of a British Whig statesman named Charles Townshend, who was famous for his violent temper. When Townshend discovered that his wife had cheated him with Lord Wharton he locked the Lady to her rooms. She remained there until her death in 1726. Her ghost was first observed in 1835, and the famous photograph was taken by Captain Hubert C. Provand in 1936. The wife of the first owner named Annie Palmer murdered three husbands and poisoned or bewitched her slave lovers before forcing the others to bury them on the beach. Her ghost causes randomly appearing and disappearing bloodstains on the walls and haunting the whole property. Bran Castle, the home of Dracula in the Carpathian Mountains, near Bran, Romania, built in the late 13th or early 14th century. It was a royal residence of the Romanian Royal Family between 1920 and 1947. There are no evidences that it was the home of Prince Vlad Dracul, but according to legends some of the impaled people are haunting here. The construction of this mansion started in 1858, but the builders abandoned it fifteen years later. It's complete from the outside, but rooms and floors are missing. One of the ghosts were caught on CCTV in October 2005, according to BBC. Some people said that the ghost of the castle's financier Sir Henry Mill Pellatt had been seen at his desk and in the indoor garden and the elevators has minds of their own. "In May 2002 Sean Ryan, a world-class musician, and along with his wife Anne, owner of Leap Castle, found a ghostly old man sitting in a chair by a downstairs fireplace. Having bade his phantom guest "good day," Sean continued about his business. After all, a new ghost dropping by unannounced, is just part of life’s rich tapestry, when you happen to live in what has long been considered Ireland’s most haunted castle." The place is haunted by an Elemental, which is known as It. After a Paracelsian concept there are four types: gnomes, sylphs, salamanders and undines (nymphs). This creature could be a gnome, because there are legends about a sheep-sized, rotting flesh-smelling entity with human face and creepy black eyes. Maybe you can still hear some footsteps and noises in the tunnels and the torture chamber. The most haunted castle in Britain, the Chillingham Castle, Chillingham, Northumberland, England. Converted from a monastery in the 13th century. The most famous ghost of the Chillingham is the Blue Boy, but some guests have heard Lady Mary Berkeley and seen blue lights, too. The Castle has at least seven ghosts including a servant girl, a piper and a woman in a ball gown. This 12th century manor house was fortified in 1377 and used by the Bishops of Chichester for centuries. Now it's a hotel. The place is haunted by a servant girl named Emily, who was seduced by a Bishop, became pregnant and then rejected. It was too much for Emily, so she jumped from the tower. Moosham Castle (also known as Witches Castle), Unternberg, Austria, built in the early 13th century, the torture site of the bloodiest witch trial ever between 1675 and 1687. There were allegedly some werewolves around the castle, but you could find more interesting paranormal activities between the walls. Some people felt, heard and spotted some ghosts and witches. Edinburgh Castle, Edinburgh, Scotland, from the 12-16th centuries. It was built on a volcanic rock and stands upon the plug of an extinct volcano. Lots of visitors have seen an old man in a leather apron, a mysterious piper or a headless drummer boy, but many people shared experiences about being pulled, touched, felt temperature drops and seen mists.